The entire project of Buenas Noches, España is nicely stated in the relationship between the above quotation, which is the final line of the film's epigraph, and its opening shot, an extended optical movement that brings a couch-bound couple from the horizon of the image to its center, as they revel in the glow of their television and huff down drugs and junk food. There's an uneasy tension between the words of a revolutionary poet and this portrait of privileged slackerdom at its most aloof, and it would be pretty easy to imagine the two coming together to form a cheap, defeatist irony: where once the night took the soldiers of the revolution, now it only claims those with enough weed to be drawn to QVC. This, fortunately, bears no relation to what Raya Martin is actually after. Rather, our couch potatoes, Pilar López de Ayala and Andrés Gertrúdix, find themselves falling very literally into another space and another time—they are, in their own way, the continuation of the leap taken by the subjunctive Katipunero at the end of Independencia, who chooses the chance of a jump off a cliff over a life of subjugation. Formally, the optical movement that begins the film also recalls "Enduring Freedom"—Martin's pick for the Moment of 2011 in this publication's recent survey—which condenses America as a self-perpetuating frame opening onto itself, deploying the illusion of progress to keep its subjects transfixed; Martin makes use of a comparable vector as a real means of getting somewhere. As the image grows in size, there's a transmission of information both narrative (the introduction of the film's sole characters) and formal (the color-filter-as-TV-glow prefigures the heavy, archaic use of filters throughout; the situation of these two in an optical netherworld where time and space no longer work in ways that we're used to neatly defines what will become an increasingly messy relationship to both). After nearly five minutes of slow-crawl zoom, the couple finally fills the 4:3 frame and a title card in a cheesy retro font appears accompanied by the sound of a sitcom laugh track, the first of a number of odd aural intrusions in this silent—that is, without dialogue, as it features nearly wall-to-wall music—film. The screen flashes to a blue-filtered image from inside a car on a country road; then, it becomes yellow as a pair of hands reach out from the back seat to cover the driver's eyes: the basic integers of Martin's algebraic montage are in place. He is blue. She is yellow. These are the stoners from the couch, now existing in a time-space where events exist as parts of a closed set to be cycled through indefinitely, each image no longer under the sway of the logic that says, for example, that if a woman is already in a car she cannot also be standing on the side of the road waiting to be picked up. 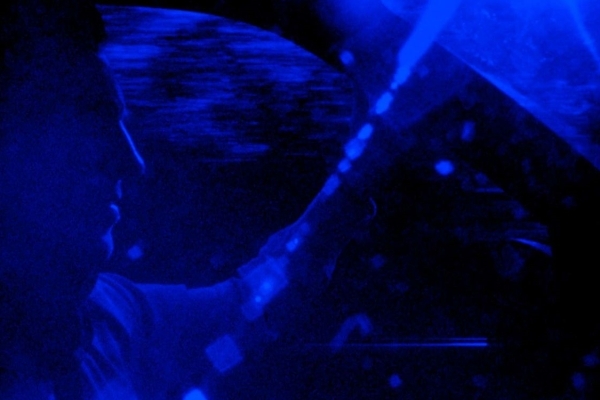 After several minutes of cycling through recurring images—shots through the front windshield, of López de Ayala asleep in the back seat, of Gertrúdix's wonderfully classical profile as he drives—the first function occurs: He and She come together under a green filter. As the lovers continue their reveries, frolicking around the Spanish countryside before eventually finding their way to Bilbao's Museum of Fine Arts, Martin modulates their romantic algebra, cutting rhythmically among yellow, blue, and green, and adding in red (pure love? a feeling that transcends the simple synthesis of man and woman? ), black and white (a sort of neutral control), and negative images (both in high contrast black and white, providing a link to Martin's 2011 short Ars Colonia, which hinges between representation and abstraction on the shift to a negative image, and in filtered shots, wherein He becomes yellow and She blue, a confirmation of their fundamental relationship: the lovers are literally each other's negative image). By defining their relationship through this visual math, Martin leaves the two free from any constricting ideas of character or narrative, which results in a portrait of two people in love that looks and feels more like actual love than any relationship Hollywood has managed to put together so far this century. This triumph of discursiveness over narrative logic not only allows for an accurate portrayal of romance, it affords the full expression of a worldview that points toward the possibility for real political action. As López de Ayala and Gertrúdix cavort through the Museum of Fine Arts, pulling faces and goofing off, their relationship toward art manifests itself: these paintings and sculptures are nothing more or less than history, which isn't in and of itself worthy of the slightest respect. Only when they encounter three paintings by 19th-century Filipino expatriate Juan Luna—"The Blacksmiths," "Market, Portugalete," and "The Death of Cleopatra"—do they suddenly become reverent, and the film follows suit, dropping its Looney Tunes sound effects and restless camera to calmly, quietly study both the paintings and the lovers' reactions. While Luna's paintings are undoubtedly powerful images, they seem no more so than any of the dozens of works previously treated with considerably less than the utmost respect. Perhaps, then, their effect owes to the peculiar place these lovers have fallen into, which is, in short, the cinema: for here, not only do images repeat, but they also become one with their own negative, the layering of negative and positive bringing together both disparate temporal registers and unique material objects in space. And so the lovers have become, like the revolutionary Luna (and also Rizal), individuals removed from space and time, set down in a world where neither the past nor the future is off limits. The ghost of Spain's colonial heritage comes to life for these young Spaniards as a fact in the present tense, which means that the power of those who opposed it presents itself as a viable option as well. Just as love was freed from the ridiculous confines of narrative, so too is the possibility for revolutionary activity freed from the coffin of history and the exile of the future. Now vibrating on the wavelength of an art that transcends the space-time of history, the lovers are truly free, which leads them to do what anyone would do in their shoes: indulge in a little teleportation (the film was inspired in part by a reported case of teleportation from Manila to Mexico City in 1593). As they journey, perhaps to the moon—as one of the few intertitles implies in a reference to Méliès's seminal work—the film ends with the lunar as well: over five rich minutes, an animated moon (which could also be the negative image of the sun) sets amid a white haze. The movement in conceptual space of the opening is matched by a vision of pure duration, pure experience: as the lovers found both the means to express their love and to find political agency through cinema, Martin offers us a way in as well, through the pleasures of his film, whether the beauty in time of this closing shot, the looks of joy on López de Ayala's magnificent face, or the richness of his colors and rhythms. Overcoming time and space must remain cinema's victory for now, but the blueprint for throwing off the shackles of narrative to redeem love and revolution in the present is available to anyone with eyes. This, it seems to me, is the future of political cinema.